Is discounting your “go to” strategy to close the sale? There are dangers in that approach that you possibly haven’t considered. 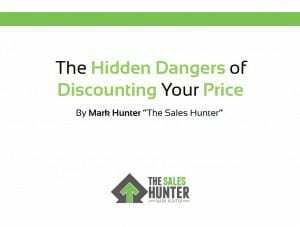 In Mark Hunter’s free eBook, you will learn specific techniques to avoid discounting. You CAN close more sales at full price, and this book will show you how.